These two notions, one indisputably true and the other somewhere between a prediction and a hope, dominated the discussion of Apple the day after Mr. Jobs stepped down as its chief executive, saying he could no longer effectively run it. Even Silicon Valley, long accustomed to seeing outsize personalities run a company one moment and be gone the next, has never seen a transition quite like this. Timothy Cook, who was chief operating officer of Apple, succeeds Steve Jobs, whose resignation moved some customers to tears. Not immediately, perhaps. Mr. Cook should have it relatively easy for the next couple of years, most commentators agreed. The company will keep putting out phones, tablets and computers that are faster, thinner and lighter than those that came before. As the former chief operating officer, Mr. Cook has plenty of experience in securing a supply of cutting-edge parts that will make this possible. But at a certain point, if Apple wants to retain or even extend its $350 billion stock market valuation, the Apple executives must channel Mr. Jobs and think up a new product — like the iPod, iPhone or iPad — that is in a different category altogether. They will have to see the future and make it real. Silicon Valley is founded on this notion, that kids in a garage can build something that will topple the existing order. Indeed, that is Apple’s own story. But it is much harder to take huge risks when you’re no longer in a garage but running a 50,000-employee company. Now he will have the chance — probably many chances — to take those risks. Many who watch Apple closely say they think he is up to the challenge. Still, genius on the Jobs level is not exactly plentiful. “Steve could build something beautiful and take all of the fright out of it. What the early Macs did was say a computer is just a tool, anyone can use it,” said Jay Elliot, an early Apple executive. Investors seem not to be looking that far ahead. Apple’s stock, which slid in after-hours trading Wednesday when the news was first released, fell only modestly Thursday even as the overall market stumbled, closing down 0.7 percent, at $373.72. They may be drawing comfort from the fact that Mr. Jobs is still around as chairman. He was on the Apple campus Wednesday for a board meeting, according to a person with knowledge of his whereabouts. “It’s better to be different than a second-rate version of what the last person was,” Mr. Pfeffer said. He compared the situation to that of Southwest Airlines, whose colorful co-founder, Herbert D. Kelleher, eventually stepped down and was replaced by a more sedate executive, Gary C. Kelly. Joining Apple was not obvious at the time, he said, because of its precarious state, which made many people think it was on the road to bankruptcy. A chief executive whom he did not name told Mr. Cook that he’d be a fool to leave Compaq, where he was vice president of corporate materials. His ultimate decision was not an obvious one, he conceded, adding that engineers are taught to make decisions analytically and without emotion. Compaq, which seemed so solid to that friend issuing the warning, no longer exists. In 2002 it was bought by Hewlett-Packard — itself a troubled company these days. There are no sure things in technology for longer than about a month. Fortunately for Mr. Cook, Apple has a number of top executives in place who can help him carry on the Jobs legacy — as long as they stick around. Jonathan Ive, Apple’s senior vice president of design, plays a critical role at the company in perfecting the look and feel of its products. British by birth, he joined Apple in 1996 and has led the team that designed the iPhone, iPad and iMac. Philip W. Schiller, senior vice president of marketing, is another important executive who helped lift Apple from near bankruptcy in the late 1990s. Apple has turned its image and sales around during his 14-year tenure. 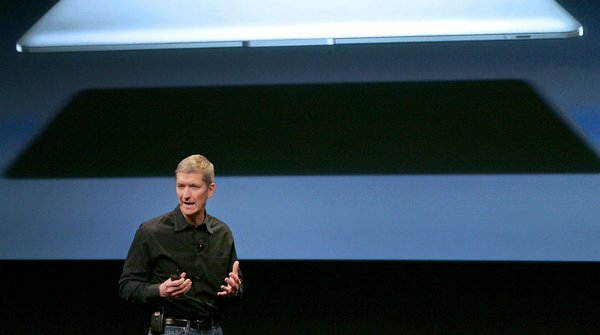 One top Apple executive has already announced his departure. Ron Johnson, who has been in charge of Apple’s thriving retail stores, said in June that he would be leaving to join J. C. Penney as its chief executive. The spotlight for better or worse will be on Mr. Cook and his willingness to take a risk on what could be the company’s next big thing.